We offer a wide range of heating services, from boiler and central heating installations, through to plumbing services. We have a team of skilled, qualified heating engineers who operate in Queensbury and surrounding areas and our reputation for the high standard of our customer service is a result of our many years of experience in providing plumbing and heating services. 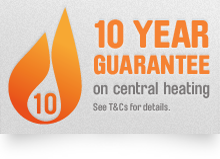 We are specialists in boiler and central heating installations throughout Queensbury. We have many years of experience in central heating services and over the years have gained a wealth of industry and product knowledge. Buying a new boiler or installing a central heating system is undeniable expensive and because of the range of boilers and systems available, can also seem a little daunting! This is why we promise to offer our customers unbiased, clear advice at all times. As energy bills continue to rise, saving money on fuel bills is becoming increasingly important for our customers. This is why we’ll spend time helping you find an efficient boiler or heating system and thanks to our range of bespoke boiler and heating packages, we’re confident that we can help you make significant savings on your annual gas bill. Annual boiler servicing is very important and at Tuke Heating we recommend that your boiler – regardless of age – is serviced once a year. Boiler servicing is essential because it is the only way to confirm that your boiler is running safely through checks for potentially fatal emissions of carbon monoxide. Safety issues aside, annual servicing will also help to ensure your boiler is reliable and performs efficiently and is a great way to avoid potentially costly (and stressful!) breakdowns. It’s important to remember that servicing is important even for very new boilers as servicing is often required to validate the warranty. We all lead busy lives and this is why our boiler service appointments are available at a time to suit you. Our team of heating engineers operate in Queensbury and we offer a range of flexible appointment times. There’s nothing worse having your boiler break down and when this happens, you need to be able to rely on the services of a reliable heating company. We are usually able to repair the majority of boilers in the first visit and the services of our heating engineers are available in Queensbury, 24 hours a day, seven days a week. Next time you need the services of a professional, qualified heating engineer in Queensbury, why not get in touch with Tuke Heating? Whether you’re thinking of installing a new central heating system or simply have a dripping tap that needs to be repaired why not get in touch today for a free, no obligation quotation?